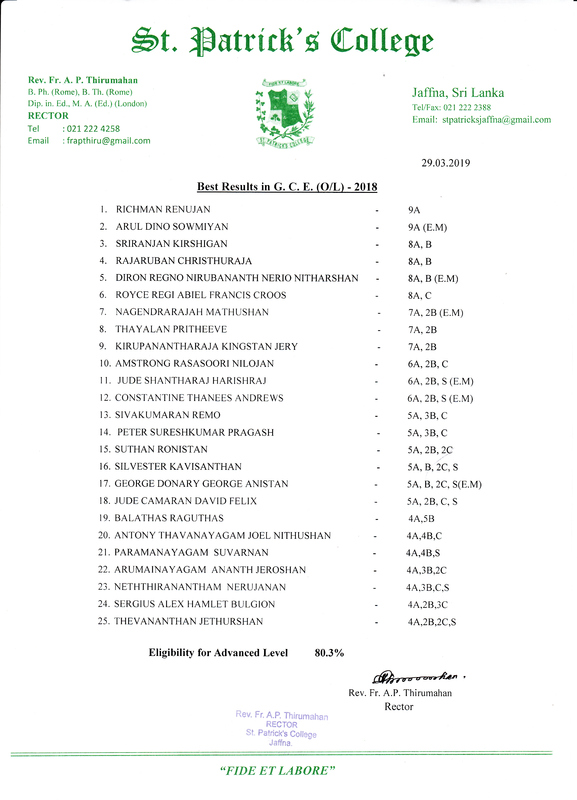 In 1904 old Patricians of that time came together and institutionalized the community of old Patricians under the name and style of ‘Old Boys Association of St.Patrick’s College Jaffna’, in order to foster the unique relationship among them. The first St Patrick’s College OBA was formed on the 29th of April 1904. OBA Melbourne is proud to be a part of this long tradition. In 1983, a few Sri Lankan Tamils gathered at a meeting in the Melbourne City Town Hall. Everyone was very concerned about the plight of our fellow brethren back home. Not long after, one of my former teachers Mr.Satchithanandan arrived in Sydney. He was instrumental in getting me to organise a St Pat’s OBA in Melbourne having himself founded the OBA in Sydney. The St Patrick’s OBA Melbourne was formed exclusively as a friendship association. The primary function was to enable old Patricians to meet on St Patrick’s Day and to enjoy each others company and reminisce about old times. It was meant to be a social group to the enjoyment of the old boys and their families. The Inaugural St Patrick’s OBA meeting was held on the 9th of February 1992 at St Joseph’s Parish hall in Northcote. We were fortunate to have our former Rector Rev. Fr. Mathuranayagam to say Mass and give his blessings to the association. Dr. A. Mariampillai of Ballarat was our very first president and Dr. E. Patrick of Carnegie, who was a long established Melbourne resident and well known physician was our very firs t patron. Dr. E. Patrick was a pillar of strength to our association and took a very keen interest in the welfare of the OBA in Melbourne. Whenever we approached him for anything to do with St Patrick’s, he was always very generous with his time and his financial contributions. The very first St Patrick’s day celebration by the Melbourne OBA was held at the Hemmingway Park in Dandenong on the 29th of March 1992. We played a social cricket match with Jaffna College and a free barbeque lunch was provided and a good time was had by all. Every subsequent year, we added different things, such as games for the ladies and for the children. We als o decided to help our Alma Mater in some small way. We offered a scholarship to the best performing student in the G.C.E. (O.L.). This was presented at the Annual prize giving. Later on we came up with the idea to have a dinner dance. This was meant to be our primary fund raising event. The objective of the dinner dance was to generate funds so that we could afford to have a free BBQ lunch or dinner on St Patrick’s Day and to have enough funds to send to the college for the student scholarship. The dinner dance was a major success as we pulled in crowds of 300 or more. Office bearers worked tirelessly with help from fellow members. The Patron donated additional funds and former presidents of the association also donated funds for door prizes on a regular basis. The St Patrick’ s dinner dance truly became a very popular event in the social calendar of the Melbournians, especially because of the excellent presentation, the standard of the bands and the quality of the food. This was evident when people asked us to inform them early when we propose to have the dinner dance, so that they could mark it down in their calendars. Since 2007, the OBA has become vibrant and active under the leadership of Jeevaranjan Fernando, and assisted by Philip Ravindraraj, Angelo Fernando and others. The membership numbers are increasing and we regularly communicate with the Rector. Annual events such as Australia Day Cricket Match and BBQ were introduced. With the establishment of the Cricket Sponsorship Fund, former Rector Fr. Justin Gnanapragasam’s long held desire became a reality. Annually a sum of $1500 is being remitted to support the college’s cricket needs, thanks to the generous contributions of the member sponsors. During the year 2008/09 we had 48 paid members out of 110 known Patricians in Melbourne. A significant achievement of the year was the formation of the musical group ‘SHAMROCKERS’, whose artistes are none other than the young family members of the OBA. Their brilliant performance under the able direction of Jerad Jogaratnam was a major highlight of a successful ‘Patrician Nite’ held in September 2008. The year also saw a 20-20 cricket match, ladies’ tug-of-war and other outdoor activities on Australia Day 2009, fund raising for the College Reconstruction Fund ($1,500 was contributed and sent to the College) in the aftermath of Cyclone Nisha, and the celebration of St Patrick’s Day 2009 on 21 March with Holy Mass said by a Patrician Rev. Fr. Florentine Rajaratnam, who was on a visit from Toronto, Canada. In 2009/10, a very successful Patrician Nite was held – the highlight was a “Koothu” choreographed by a Patrician, Pillai Mariasegaram. The surplus ($1,500) was sent to the College to assist with the education of students from Vanni who had been affected by the war. 18 boxes of books obtained from the University of Melbourne by Yaso & Jeeva Fernando) were sent to the College Library. The popular rivalry with the Jaffna College Old Boys’ Cricket team was revived with a “Battle of the Old Golds!” on Australia Day 2010. The annual mass to celebrate St Patrick’s day and AGM was well attended. In 2010/11, A memorial mass was celebrated by the Tamil Chaplain, Rev. Fr. Antony Gnanapragasam for the repose of the soul of Rev. Fr. T.A J. Mathuranayagam, Rector of SPC from 1966 to 1976. The Patrician Nite 2010 was a great success with the Bollywood theme and dance music kept members, families and friends entertained all night. 2010 is the 18th year of the Association and it is hoped that a tradition has commenced with about 50 members assembling on the stage to sing the “Alma Mater”. On Australia day 2011, members played a 20-20 match and St Patrick’s day celebrations were held on 19 March 2011, with the annual mass, AGM and the traditional “stringhopper” dinner. In 2011/12, another very successful Patrician Nite was held with entertainment provided by the famous Ravi Muthu. 47 members took to the stage to sing the College Anthem. Australia Day cricket match & bar-be-que was attended by 36 members and families. The 2012 Annual Mass on St Patrick’s day & AGM was attended by 25 members and their families. In 2012/13, 53 members and their families and friends participated in the Patrician Nite on 15 September 2012. Entertainment was provided by our very own musical group and entertainers “Shamrockers”. Traditional family day was held on 27 January 2013 with cricket and rounders matches played during the Australia day weekend. AGM 2013 was held on St Patrick’s day 2013, after the annual mass celebrated by Rev. Fr. Anthony Gnanapragasam and followed by “Stringhopper & Pittu” dinner provided and hosted by Committee members and their wonderful spouses. 2013/14 – Patricians contributed $3,500 towards the OBA’s special project to renovate the sanctuary/altar area of the College Chapel. On Sept 21, 2013, 54 members, their families and friends celebrated the 21st birthday of the OBA at the Patrician Nite 2013 where the guest of honour was the College’s current Prefect of Studies Rev Fr Lebourn Jesuthasan O M I and the highlight of the night was the play அதிரடி மன்னர்கள் performed by Patricians. Traditional family day was held on 26 January 2014 with cricket and rounders matches played during the Australia day weekend and entertainment for the kids provided by “Noodles the Clown”. AGM 2014 was held on 22 March 2014, after the annual mass concelebrated by Rev. Fr. Michael Patrick, Rev Fr Anthony Gnanapragasam & Rev Fr Jacob Thevasagayampilai. The Mass was offered for the repose of the soul of Thanushan Amalan, who was killed in tragic circumstances at the 97th “Battle of Golds” cricket match held at Vaddukoddai on 15 March 2014 and the mass book signed by the priests who concelebrated mass was sent to his family with a letter of support and condolences. $500 was also paid into the “Jeyaratnam Thanushan Amalan Assistance Fund” which had been established by the OBA Jaffna and the College to help his young family. 2014/15 – 62 Patricians with their families and friends attended the Patrician Nite 2014 held on Sept 13, 2014. The highlight of the night was a play by Patricians titled வாடிப்போன வாத்தியார் ஆடிப்போனார் The annual Family day was held on 25 January 2015 with cricket and rounders matches played during the Australia day weekend and entertainment for the kids provided by “Noodles the Clown”. 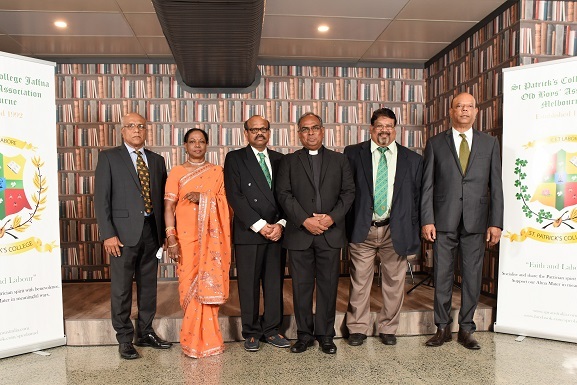 AGM 2015 was held on 21 March 2015, after the annual mass celebrated by Rev Fr Anthony Gnanapragasam. Trophies from the cricket day were presented at the AGM by visiting patrician, Mahan Thuraisingham. 2015/16 – 44 Patricians with their families and friends attended the Patrician Nite 2015 held on Aug 29, 2015. At the event, Fr John Sherman OMI – who inherited the cross previously carried by Fr Timothy Long – easily the most distinguished Rector of the College – blessed the gathering with the cross. The annual Family day was held on 26 January 2016 with a cricket match played and entertainment for the kids (big and small) provided by “Pirate Sean”. AGM 2016 was held on 19 March 2016, after the annual mass celebrated by Rev Fr Anthony Gnanapragasam. 2016/17 – To commemorate the 25th year of the formation of the OBA, the Committee decided to establish a “Perpetual Fund”. In 2008, a special fund was created by the OBA – at the request of the then Rector, now the Bishop of Jaffna, Rev. Dr. Justin Gnanapragasam – to support the cricket activities of the College. To date, a total of $12,000 had been sent to the College for this cause. The Perpetual Fund will self-fund the annual remittance. On September 3, 2016, 50 Patricians, families and friends celebrated Patrician Nite 2016. 2017 – 25th year of the OBA – Patricians met at Wattle Park for the annual family day on January 26, 2017 to launch the year and 4 teams played 3 cricket matches to decide the winner of the trophy. Bonjean House emerged as the victor and Matthews House was runner-up. Ladies played rounders, kids played tennis and some of the seniors played golf. It was a great day!. AGM 2017 was held on February 12, 2017 and St Patrick’s Feast day was celebrated with over 120 participants on March 18, 2017. Holy Mass was concelebrated by visiting Patrician, Rev Fr Jeyaraj Rasiah SJ, Patrician and former chaplain Rev Fr Albert Yogarajah and our chaplain Rev Fr Anthony Gnanapragasam. 2017 – Nov 17 to 19 – 3 day carnival to celebrate the OBA’s Silver Jubilee. Guest of Honour – Rev Fr Jero Selvanayagam, Rector. Perpetual Fund – amounting to Rs 3 million – has been established and interest earned will be paid to the College annually. Perpetual diary commemorating the 25th anniversary was distributed to Patricians and well wishers who attended Patrician Nite 2017. 2018 – Battle of “Old” Golds held on Feb 4, 2018. St Patrick’s Day celebrated on March 17, 2018. Patrician Nite 2018 was well attended with 54 Patricians, their families and friends and the highlight was the ‘conga line’ stretching across the entire hall. 2019 – Cricket & Family Fun day was well-attended and the highlights, in addition to the cricket matches, rounders and golf, were a trial game of “Kilithaddu” organised by the ladies and a soccer match for the young Patricians . St Patrick’s Day Mass was attended by 90 Patricians and families. On this day, we also farewelled our chaplain, Rev Fr Anthony Gnanapragasam, who has celebrated the St Patrick’s Day Mass for the Melbourne OBA for the last 10 years. Together, we hope to continue the long held traditions of St Patrick’s Jaffna Old Boys’ Associations around the world and contribute in a small way to the continued success of our dear Alma Mater.